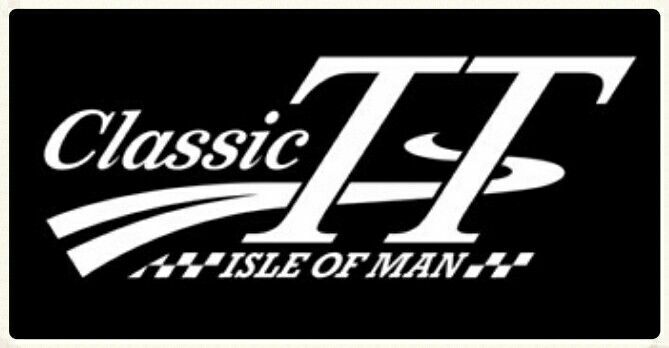 Well, last week the Classic TT was held at the good old Isel of Man, this is one of the best race meets to go and watch and one day I will attend this too. Well, another great race series on the Ilse of man is the Classic T.T. with early Classic and up to modern bikes and its brilliant to spectate. After a delay of almost four hours due to technical issues with the communications system between Sector Marshals and Race Control, the second day’s racing at the 2015 Classic TT Races presented by Bennetts finally got underway at 2pm. Conditions were reported as perfect for racing around the Mountain Course with dry roads all round the 37¾ mile circuit. However, that didn’t prove to be the case as Dan Cooper, riding the Team Molnar Manx Norton, held a lead of over a second going into the final lap only for the Gloucester rider to retire at Ballacraine with a split fuel tank, leaving Michael Rutter on the Ripley Land Racing Honda with a commanding lead of over a minute and ultimately the race win. Behind the Midland’s based rider, the war of attrition saw only four of the fifteen fastest qualifiers complete the race. Shortly before the start, Dean Harrison was a late withdrawal leaving Lee Johnston, last year’s race winner and fastest qualifier, on the MV Agusta, as the sole Black Eagle Racing representative. However, the Northern Ireland rider had a poor start, which saw him in 8th at the opening checkpoint at Glen Helen. He was down to 17th by the second checkpoint at Ballaugh and out of contention before retiring shortly after. Rutter opening lap of 100.988mph (22:24.995) gave him a lead of almost 2 seconds from Cooper (100.848mph/ 22:26.848) with Keith Amor (98.429/ 22:59.954)) moving into the top three at the end of the first lap following Coward’s retirement. Chris Swallow was a further five seconds back in fourth with Philip McGurk (97.532/ 23:12.652) completing the top five at the end of the opening lap. However, Swallow’s challenge was effectively ended with a 30 second technical infringement penalty as a result of a reported pit crew infringement, one of four riders to pick up penalties. However, with Cooper retiring at Ballacraine on the final lap, Rutter was left to take the chequered flag in a overall time of 1:06.51.993/ 101.566, with last lap of 102.356mph/ 22.07.013 the fastest of the race. With Cooper retiring, McGurk, the leading privateer, moved into the final podium place but the drama didn’t end there with Chris Swallow retiring at Graham Memorial, McGurk moved into the runner up slot. Nigel Moore was also a last lap retirement when running third, shortly before the chequered flag, leaving Doug Snow to take the final podium place. Snow had to be brought back from Parc Ferme to the winner’s enclosure, so close was Moore to the finish line before he broke down. David Madsen-Mygdall (Team Gimbert Racing) and James Hillier Honda/CSC Racing completed the top five with Dave Edwards claiming the Phil Read trophy for the first 250cc machine home. Fans around the Mountain Course were treated to one of the biggest highlights of the 2015 Classic TT presented by Bennetts – Norton: The Rotary Years sponsored by the Isle of Man Steam Packet Company – a parade and celebration of the Norton rotary motorcycles that took countless wins and podiums in the British Championship, as well as at the Isle of Man and other International road races between 1987 and 1994. The Norton rotary has appeared in many parade laps around the Mountain Course – and, of course, enjoyed tremendous race success – but never before have so many appeared in one time on the island. Indeed, Saturday’s lap saw no less than 12 of the revolutionary machines, owned by the National Motorcycle Museum, take to the 37.73-mile course. The first incarnation of the rotary developed by Brian Crighton, the driving force behind the machines, was the RCW and that formed more than half the parade line up with seven of the black clad John Player Special sponsored machines lapping the Mountain Course. A number of the riders appeared on their original bikes while appropriate replacements were identified to represent some of the greatest names in Motorcycling history. The first bike to get the parade underway was the RCW Twin Shock prototype, a bike that was built for Steve Spray, who rode for JPS Norton in 1989 and 1990 after a successful outing at Brands Hatch at the end of 1988. 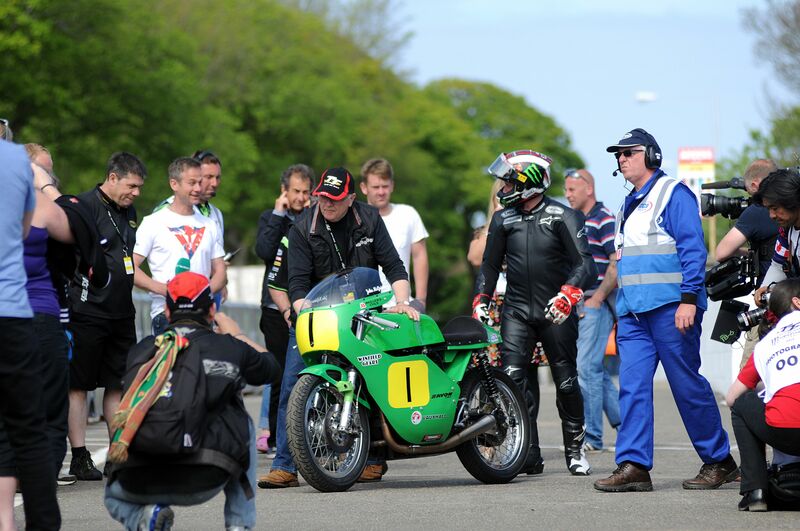 ITV4’s Steve Parrish was on-board the machine that is adorned with the number 0. Fellow ITV4 commentator James Whitham was next away, riding the number 0 machine made famous by Ron Haslam, who returned to the British Championships after many years in the 500cc World Championship. Haslam rode for the JPS team for two years, taking numerous wins and podiums. The third machine to leave the line was the number 4 machine ridden today by Michael Rutter. This bike was taken to great success by the late Robert Dunlop, who was part of the Norton team between 1990 and 1992 and who finished third in the 1990 Formula One TT, his first race around the Mountain Course on one of the rotary machines. Wiltshire rider Trevor Nation, Robert’s teammate for two of those years, was reunited with his familiar number five machine. Nation was an integral part of the Norton team from 1988 until 1991 and, like Dunlop, he took a rostrum finish at the 1990 TT event, taking second behind Carl Fogarty in the Senior race. Ulsterman Steve Cull, who had a solitary season with JPS Norton in 1989, was another original team member who appeared. The then outright TT lap record holder was out of luck at the TT that year but riding under number 8, the Bangor rider did take a strong third in the Ulster Grand Prix Formula One race, only defeated by Steve Hislop and Carl Fogarty. Another of the ITV4 team – Steve Plater – took the number 17 machine, Ray Stringer’s career-long number, the Leicestershire rider having selected outings on the JPS Norton in 1990. The other RCW Rotary to leave the line was campaigned by Steve Spray who dominated the 1989 Shell Supercup and MCN Superbike Championships. Peter Hickman, the fastest ever TT newcomer, rode the number 17 machine that Nottingham’s Spray was so successful on. The next stage of development of the 588cc machine was the NRS Rotary. Ridden at the TT in 1991 by Nation and Dunlop, the former set the first 120mph lap on the machine during the Formula One race and finished third although he was later disqualified for an oversize fuel tank. Conor Cummins got his first taste of a rotary Norton, adorned with Nation’s regular number five. Robert Dunlop was the second NRS rider in 1991, and again in 1992. Like Nation, he suffered disappointment at the 1991 TT but made amends a year later when he took third in the Senior TT race and set his fastest ever lap of the Mountain Course at 121.53mph. His youngest son, Michael, no stranger to Norton, took the second number 4 machine out in the parade. The final works NRS Norton Rotary in the parade was arguably the most famous – ‘The White Charger’ that the late Steve Hislop famously rode to victory in the 1992 Senior. Voted the greatest TT race of all time, Hislop rode under number 19 that day to defeat Carl Fogarty by just 4.4s and 23-times winner John McGuinness had the honour of riding the machine in Saturday’s parade. The last rotary machine that completed the parade was never actually raced at the TT but was arguably, the most successful – the Duckhams QXR Crighton Rotary. Mark Farmer and Jim Moodie rode the machine in 1992 and 1993 respectively but another Scots ace, Ian Simpson, replaced Moodie in the team in 1994 where Phil Borley joined him. Together, the duo were rampant dominating races up and down the country. However, it was Scots ace Simpson who won that year’s British Superbike Championship. Simpson was reunited with the number 25 machine that took him to the title. William Dunlop was the final rider out in the parade, riding under number 6. The bike was the same one that he will ride in Monday’s Formula One Classic TT race and is a bike that was originally developed alongside the Duckhams QXR machines. 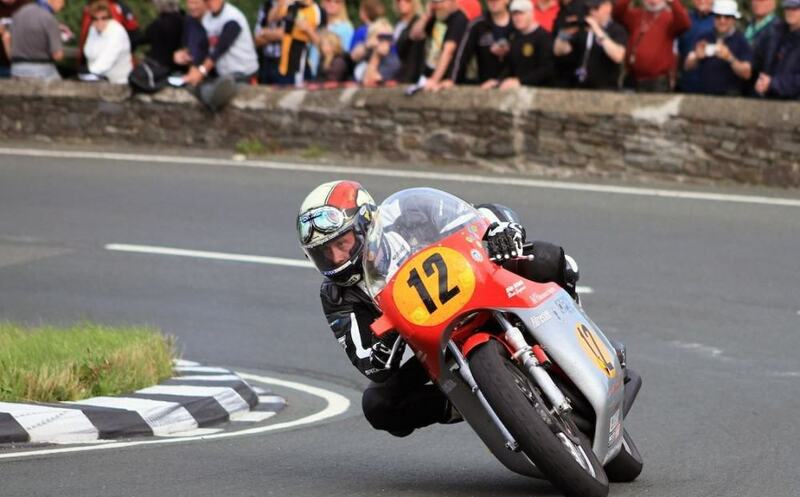 Yorkshire’s Dean Harrison, riding the Black Eagle Racing MV Agusta, won an eventful Bennetts 500cc race, the opening race of the 2015 Classic TT meeting. Harrison went in front at Ramsey on the opening lap and eventually finished 26 seconds ahead of Ian Lougher on the Giovanni Cabassi Paton with Harrison’s teammate Lee Johnston taking the final podium place. However, the old adage that ‘to finish first you first have to finish’ has never proved more appropriate with the Team Winfield pair retiring on the opening lap in Ramsey. Welshman Lougher’s challenge was also effectively over after he picked up a thirty second pit penalty, as he did in the same race in 2014, after a refuelling pit stop at the end of the first lap, although a dramatic charge from the Flitwick Motorcycles rider through the field saw him move up from 8th to take the runner up spot. Harrison’s opening lap of 110.463 gave him a 15 second from Lougher at the end of the opening lap and with Lougher’s pit stop and penalty the lead was extended to well over a minute from the Welshman by Glen Helen on the second lap. Harrison’s teammate Lee Johnston was his closest challenger and at the end of the second lap he was18 seconds behind with Michael Dunlop in third. Lougher had moved up to fourth with Danny Webb completing the top five. The pre-race debate centred around refuelling with the single cylinders of the likes of Michael Dunlop and Danny Webb on the ’62 Molnar Manx Nortons, running straight through while the twins, triples and fours were obliged to pit on the 151 mile race but the MV’s and Lougher’s Paton proved too strong on the road and the pit stop didn’t dramatically influence the race, apart from Lougher’s penalty. Lougher moved up into second place at the end of the third lap but Harrison’s lead was up to 25 seconds and the Yorkshireman duly brought the MV home for a dominant win in 108.855 (01:23.11.161) from Lougher who recorded 108.273 (1:23.37.965) with Lee Johnston taking the final podium place with107.972 (01:23.51.978). Michael Dunlop was reported as retired at the Mountain Box on the last lap leaving Jamie Coward on the Craven Honda to take fourth place. Chris Swallow, first single cylinder machine home, riding the D.G Kenah Norton completed the top five. He was followed home by Keith Amor on the Tony Dunnell/Rig Deluge Manx Norton after fighting back from an unscheduled first lap pitstop which left him in twelfth place at the start of the second lap. Dave Madsen Mygdal, who finished seventh, stood on the podium as the first privateer home. Johannes Van de Pol came off at Tower Bends and was taken by airmed to Nobles Hospital where he was reported to have leg fractures. Away from today’s race the attention was focused on Bruce Anstey’s F1 qualifying lap earlier in the day when the flying Kiwi scorched round the Mountain Course. Transponder issues meant that he was awarded a time of 122.546 (18.23) for both laps but with the second a flying lap, speculation was that he had exceeded the Classic TT lap record of 123.894mph that he set last year. Regardless, the kiwi is clearly set fair for Monday’s Motorsport Merchandise F1 Race although Peter Hickman with a 123.364 (18.21.037) in the same session, topped the overall F1 qualifying leader board and will undoubtedly challenge the Kiwi for the race win as will fellow Kawasaki mounted Dean Harrison and Team Classic Suzuki pair Michael Dunlop and Lee Johnston. In the 350cc qualifying session ahead of Monday’s Okells 350cc race, Michael Rutter on the Ripley Land Racing Honda (100.665) and Dan Cooper on the Team Molnar Manx Norton (99.364) both clocked their fastest laps of the week to finish second and third overall on the qualifying leaderboard but the pair were behind Lee Johnston’s time (102.321/22:07.468) from Thursday’s session. Riders took advantage of dry roads all round the Mountain Course for a final shakedown in the last qualifying session before tomorrow’s Bennetts 500cc Classic TT Race, the opening race of the 2015 Classic TT Races presented by Bennetts. Ahead of the session competitors were warned of sun dazzle, making a change from conditions earlier in the week, although high winds were reported at Ballacrye and up on the Mountain section. The session got away at 6.20pm and the Patons were to the fore with Ryan Farquhar on the 1972 Team Winfield Paton topping the leaderboard with 110.006 from teammate John McGuinness (109.090) with Ian Lougher riding the Giovanni Cabassi /Flitwick Motorcycles Paton third fastest (108.043) in the class on the night. However, there was a war of attrition further down the field with a number of high profile retirements including Gary Johnson on the John Chapman Racing MV. CSC Racing Honda teammates Conor Cummins, who was reported to have smoke coming from his machine at Glen Helen and James Hillier both failed to complete a lap. Lee Johnston riding the Black Eagle Racing MV was also a retirement on the opening lap but teammate Dean Harrison enjoyed better fortunes and posted the fourth fastest 500cc lap of the night with 107.545. Harrison continued his good form in the F1 class, which got underway shortly before 7.30pm, on the Steelcote Solutions Kawasaki ZXR 750. The Yorkshire rider posted the fastest lap of the night with 122.767, marginally outside Dunlop’s time from Thursday’s session, laying down the gauntlet to Northern Ireland rider on the Team Classic Suzuki GSXR whose fastest of the evening – 121.491 – placed him second in the session. Australian Dave Johnson on the Team York Suzuki GSXR posted a pair of fast laps with his second – 120.845 – putting him third on the evening’s F1 times with Bruce Anstey on the Yamaha YZR 500 posting his most competitive lap (120.306) of the week to ignite the anticipation for Monday’s Motorsport Merchandise race. Further down the field William Dunlop posted a popular 114.048 on the Rotary Norton, fresh from the National Motor Cycle Museum showroom but pulled in on Bray Hill on his second lap. In the F2 Class, last year’s race winner Ian Lougher, on the Laylaw Racing Yamaha, again showed that he will be the man to beat in Monday’s F2 Race, posting the quickest lap of 109.381 from nearest challenger Ryan Kneen, who was timed at 109.176. Competitors at Classic TT Races presented by Bennetts enjoyed their first full qualifying session this evening as the Mountain Course was bathed in sunlight and riders were even warned about glare. The F1/F2 and 500cc’s were first on the track with Michael Dunlop and Michael Rutter, as they did in last night’s session, managed to get to the front of the queue of bikes in pit lane and got away first at the scheduled start time of 6.20. Dunlop went out on the F1 Team Classic Suzuki while Rutter opted for a lap on the Seeley /Ripley Land Racing machine that he will race in Saturday’s Bennetts 500cc Race. Bruce Anstey went out on the Valvoline by Padgetts Racing Yamaha YZR500 that he won last year’s race on and completed a steady first lap before stopping at Sulby on his second lap while James Cowton and Chris Moore both clocked 107mph laps in the F2 Class. Tomorrow’s session sees the 500’s out first at 18.20 with the F1 and F2 machines due to go out at 19.25 and the riders will be hoping for another clear session ahead of Saturday’s first race, the Bennetts 500cc. This evening’s qualifying session for the 2015 Classic TT presented by Bennetts got away on time at 6.20pm with Michael Dunlop on his Team Classic Suzuki and Michael Rutter riding a replica of his father Tony’s 84 World Championship F1 Ducati getting the session away. Unfortunately two accidents near the 13th milestone early in the session resulted in the session being red flagged before the weather closed in and it was called off shortly after 7pm. Michael Dunlop (114.29) and Dean Harrison on the Steelcote Solutions Kawasaki were the only riders to complete laps in excess of 110mph ahead of Russ Mountford on the Silicone Engineering Racing Kawasaki (109.72) and Michael Rutter (105.47). Michael Russell (Bragg Creek Powersports Honda), Timothee Monot (TMR Performances Moto Honda), Jamie Coward (Mistral Racing Kawasaki), Dan Stewart (Wilcock Racing Kawasaki) and Nick Jefferies (Team Classic Suzuki) were the only other riders to clock over 100mph. This entry was posted in Blog and tagged 59 club, ace cafe, Castrol, Classic racers, isle of man tt, manx, rockers, ton up.